In the ever changing modern world it is becoming more and more common for people to move to completely foreign countries for work, or even to retire! For Americans, Canadians, and some Europeans, Mexico is currently one of the most common choices. There are, of course, a number of reasons that they choose to do so, but Mexico’s stunning natural beauty, lower cost of living, and high-quality health-care no doubt influence many people when they choose to become expats in Mexico! Nightlife for expats: if you’re staying in or near a tourist hotspot you will definitely find yourself within easy reach of the very best nightlife around. Bars, jazz clubs, nightclubs, and booze cruises abound! Cuisine for expats: f you’re a foodie Mexico will really tickle your pickle – you will find street food on most corners, and fine dining establishments peppered throughout all tourist towns and big cities. Culture for expats: street performers and theatres can be found in many of the big tourist towns, but all cities will have cinemas, theatres, and art galleries to enjoy . You’ll never be bored if you retire to Mexico, better still there are options to suit every personality and budget! If you prefer hiking tours to wine tastings, you can find that (you’ll be able to find both, to be fair), and if you’d rather party in the clubs rather than stroll around art galleries you will certainly find that this is possible. One really big factor in most people’s choice to move to Mexico is the lower cost of living and the affordable healthcare on offer. Healthcare is, of course, at an all time high in the USA, and many Americans find it hard to afford the medications that they need. This only gets harder during retirement, of course, but in Mexico private healthcare and prescription medications are much more reasonably priced, even when you are an expat in Mexico and sometimes pay higher prices for things. For example, the cost of a doctor’s visit will generally range between 500 and 700 pesos; thanks to the exchange rate this is around about $30 – $40 USD. Likewise, a medication which costs $175 USD in the USA will generally cost around about 175 pesos, which equates to about $10. Of course, this has much to do with the beneficial exchange rate at the moment, so you can expect some fluctuation. Furthermore, the cost of living in general is lower here; rent, utilities, food, and even life’s little luxuries are all a little less costly here so you can enjoy a better quality of life. 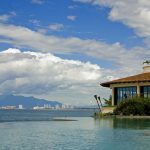 So, what does it actually cost to live in Mexico when you retire? According to www.internationalliving.com, the retirement website, it would take around about $2,175 USD/month for the average couple to enjoy a good quality of life here. That figure includes rent, utilities, food, entertainment, healthcare, and even an allowance for a cleaner and gardener! As the average retired American (according to 2017 statistics from the Social Security Administration) earns $1,369 USD/month from their pension, the average retired couple would be quite comfortable in a Mexican retirement! So, in conclusion, Mexico offers not only great value for money, but good weather, a stunning landscape, and some of the best attractions, nightlife, and cuisine on the American continent… what’s not to love? Could this financially savvy decision be just right for you? Will you be joining the warm and friendly Mexican people? Let us know in the comments section below, or if you are a Mexican expat let us know what awaits people who take the plunge! Wanna be an expat in Mexico? We hope to see you on the beach!